One of my favorite hobbies is genealogy. Not only do I enjoy discovering the “who was” and “where was” information of my own family, I get tremendous satisfaction from helping others discover their roots. I belong to several groups on Facebook where I get to do this, and it can be a lot of fun. It can also be painful at times. What I have learned about families is, unless you were there and saw the child delivered out of the mother with your own eyes, you cannot believe much of what you have been told, and often cannot believe the “documentation” either. Genealogists love to harp about “the documentation.” Family trees on sites like ancestry.com that do not have the “proper” documentation drive many genealogists nuts because without documentation, it is all conjecture. Like with any hobby, there are those who dabble in genealogy, those who are professionals, and those who are in-between. People who belong to groups such as the Daughters of the American Revolution or the Mayflower Society take this pastime very seriously. You should not even feign a joke about these groups else you be flamed, and flamed until you are well done. Their documentation is beyond reproach. Every family has skeletons in the closet; every family has lies, lies, and more lies. When I volunteer to help someone with a tree, I try to be certain the person is ready to handle whatever we may find. I know someone who discovered her great grandparents were in prison because they were moonshiners. I know someone who found out his aunt is really his sister. Another person found out a distant cousin is in prison for child molestation. In some cases, no one in the family knew, but in many instances, some people did. Family secrets usually get out, often at the most inopportune time; when the family is already grieving, when it is too late to make amends, when it is too late to ask “why,” when it is too late to have a relationship. We are all liars. There’s the classic, “Honey, does this dress make me look fat?” We tell ourselves we are not like “those” people; we are not law breakers, but I don’t know anyone who doesn’t exceed the speed limit at least once in a while. If there is no such thing as big sins and little sins, is there such a thing as little lies and big lies? Must we lie about family circumstances to protect others? Do we somehow try to play the role of the Creator when we decide what is for another’s “own good” or is it our own self we are trying to protect? I have been very fortunate because my Mom was always very honest about her family, even the parts that were not like “Father Knows Best.” At age appropriate times, I learned about her childhood, young adult life, my parents’ early married years, etc. While my Dad did not share as much until more recently, I know the good, bad, and the ugly about his family as well. I do not love any of my family members any less by knowing about some of their missteps. If we cannot tell our children the truth about who we are and where we came from, and the truth about who they are and where they came from, what can we tell them? If my beloved holds secrets about the past, how can I be confident about our future? 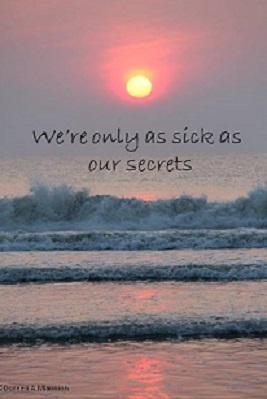 There is a phrase used in recovery programs such as Alcoholics Anonymous: You are only as sick as your secrets. No more family secrets. With the Internet and information age we live in, they are going to be impossible to keep. Tell the truth, at age appropriate times. Lies build prisons of pain. The truth shall set you free. You know the truth. When we try to hide it, gently remind us to let it be free. Help us forgive ourselves and one another for mistakes we have made and will make. Let us be loyal and just to those around us, let us walk with integrity of mind, spirit, and action. Keep our houses empty of those who practice deceit and our presence clear of those who lie. Family secrets have put so many walls and road blocks in my research. It has taken years to undo and may take many more. Your post hit home today. I hope you are able to overcome the walls and road blocks and uncover the truth, no matter how painful. Thanks for reading. My family was the same way…. No secret too big or too small… All were revealed to us kids at appropriate times so we could make well informed choices pertaining to our lives! Have tried to be the same with my own two (though hubby doesn’t always agree). Honesty is the best policy…. Keep writing girl!!! I think the key is “appropriate” times. Thanks for reading, and for your support!